The Most Dazzling of All Iris! A multitude of miniature, dainty flowers of striking, clean color are sure to grab your attention. 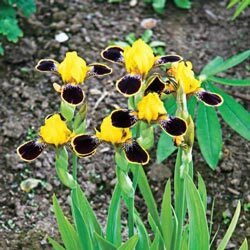 Bright yellow and deep maroon blooms show off early in the Iris season. Grows 18-20" tall. Bloom Time Early to Mid spring. Foliage Type: Green sword-like fans of foliage in clumps. Bloom Time: Early to Mid spring. Flower Form: Miniature , dainty flowers with light yellow standards that are veined with deep maroon at the base and deep maroon falls that have a narrow yellow margin. 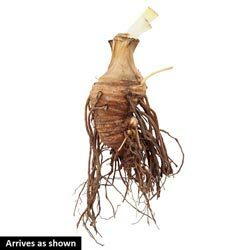 Planting Instructions: Plant so tops of the rhizomes are exposed and the roots are spread out facing downwards in the soils. Pruning: Divide when clumps becomes crowded and bloom diminishes about every 3 to 4 years during the summer. After hard frost in fall, cut foliage back. Winter Care: Mulch in colder climates and remove in early spring.